A head-first dive into the tyres for Jason Bright, a run in the mud for Cameron Waters and a loose wheel for Russell Ingall were the incidents that stood out on a largely trouble-free Winton test day for Brad Jones Racing, Ford Performance Racing and Lucas Dumbrell Motorsport. On a cool but thankfully clear and sunny day, all three teams got in a significant amount of testing and developing as well as lots of laps for co-drivers as the Pirtek Enduro Cup looms. Times on used tyres dropped into the 1min22s, well shy of Fabian Coulthard's 1min19.6538 pole position lap set on grippy sealant back in April. Also notable for their presence today was Dragon Motor Racing, the ambitious new team which has gained wildcard entries for both the Wilson Security Sandown 500 and Supercheap Auto Bathurst 1000. Meanwhile, three cars ran at Queensland Raceway and while rain threatened, both TEKNO Autosports and Triple Eight had clear running for the duration of the test. Here's our team-by-team summary of how the day panned out. BJR tested five cars and seven drivers. The Fabian Coulthard (Lockwood Racing), Jason Bright (Team BOC) and Dale Wood (Advam/GB Gal) Holden Commodore VFs all hit the track, along with Chris Pither and Macauley Jones' Dunlop Series Commodore VEs. Luke Youlden lapped in the Lockwood entry and Andrew Jones drove the BOC Commodore. However, there was no co-driver testing out Wood's car. Pither tested that car last time but stuck to his own program today. Andrew Jones also worked with cousin Macauley to improve his pace and he took two seconds off his time during the day, descending to high 1min24s. Jason Bright's off in the #8 Commodore came at the 90-degree downhill Turn Three, pushing hard on old tyres while testing suspension tuning. "He slipped off the track, understeered and hit the tyres," explained team manager Chris Clark. "He went into the tyre wall there and buried it in a bit. But no major damage, we just cleaned it up and sent it out again. "That was definitely not driver error," Clark added. "We are testing and trying to find some boundaries and we definitely found one there. He was pushing the limits on the tyres we had to test on, they had run out of life and got to that woeful stage." Clark said the team felt it had also made some improvements to the behaviour of Coulthard's car after his perplexing variations in pace at the Castrol Townsville 500 - Driven By TAFE Queensland. But he admitted engine performance was a part of the issue and improvements may not come on that front for a little while. "We are on that case at the moment," he said. "I am hoping to have something for Sandown, but we will just have to wait and see." As well as performance testing, including some suspension geometry experimentation and further work with the Triple Eight 'Mk 5' front upright in Coulthard's Commodore, there was also a round of pit stop practice for the upcoming enduros. Clark said they progressed significantly from a pretty ordinary first attempt. "The first one was pretty good fun," he laughed. BJR plans to test again before the enduros. The factory Ford team tested five cars and eight drivers. The Pepsi Max Falcon FG IIs of Mark Winterbottom and Chaz Mostert were joined by the Bottle-O Ford driven by David Reynolds and the Jeld-Wen entry of Jack Perkins. Co-drivers Steve Owen (Winterbottom), Paul Morris (Mostert), Dean Canto (Reynolds) and Cam Waters (Perkins) all had a run. Waters also tested his development series Falcon. However, he was in the Jeld-Wen car when he ran wide at Turn Three. "Apart from putting a load of mud on the car there was no damage," reported FPR team boss Tim Edwards. Edwards said he was pleased with the overall progress of the test, which focussed on performance and co-driver laps rather than pit stop practice for the Pirtek Enduro Cup. "We had a good day overall," said Edwards. "We tested quite a few things, some of them validating things we had learned and previous tests or races. "Some of them proved positive, some of them prove inconclusive and while you are always tyre challenged on test days we were certainly very consistent on times." The team will devote an entire day to enduro practice before Sandown. A loose wheel literally halted LDM's test program this morning. But after the Repair Management Australia Holden Commodore VF was transported back to the pits and repairs made, the car ran strongly for the rest of the day. "The centre lock didn't capture properly and the wheel just came loose," explained team owner Lucas Dumbrell. "He just stopped on track and we came out and tightened up the wheel and towed it back." The day comprised a combination of performance testing of the car and a chance for the team - which is essentially reconstructed for 2014 - to continue bonding. 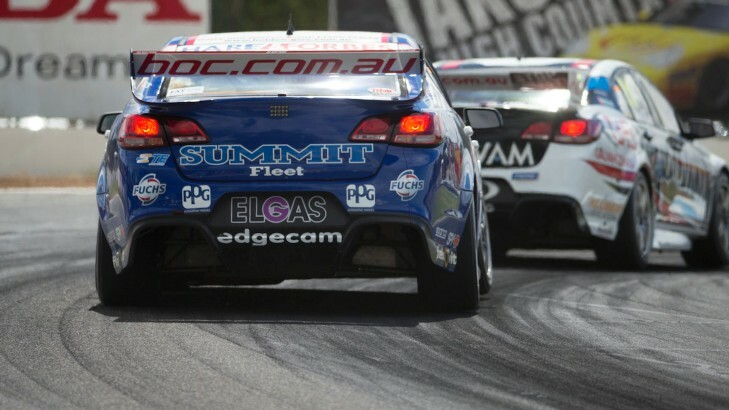 "We are fine tuning the car and also working on the continuity of the group," Dumbrell confirmed. "No silver bullets today, just working on what we have going." Dumbrell also confirmed that Ingall was not the only driver of the RMA Commodore on the day, but refused to say who was also having a steer. The team has yet to confirm its Pirtek Enduro Cup co-driver. The team plans another test prior to Sandown.